Life Outside the Fishbowl: It's a Nerf Gun Party! It's a Nerf Gun Party! This year Thomas decided he wanted to have a Nerf gun party, complete with an all-out capture the flag battle. 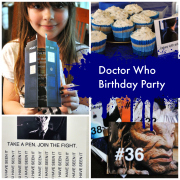 We did quite a bit of searching and heavily relied on ideas we found on Pinterest. 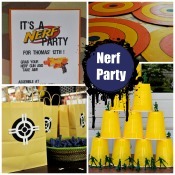 You can look through my Pinterest idea board here for the Nerf party. We started with handmade invitations, designed by Thomas. He really wanted the logo and a picture of a nerf gun on the front. I designed them in Photoshop and printed them on plain white cardstock. We layered orange cardstock and camouflage paper on top of a 5x7 card. We also decided to supply the party guests with their own gun and quite a bit of darts, assuming they'd probably lose a good chunk in the yard. Luckily Target was having a BOGO 40% off sale on all nerf products -- so we stocked up on both guns and darts. Each boy started out with around 15 darts and we had a large bowl with extras in easy reach. In addition to a Nerf gun, we added an ID tag, pop rocks, and a camo dart bag (home made) to make up a goody bag. I used my Silhouette to create the design for the bag. ** update: download a free png file of this design here. Just right-click to save. 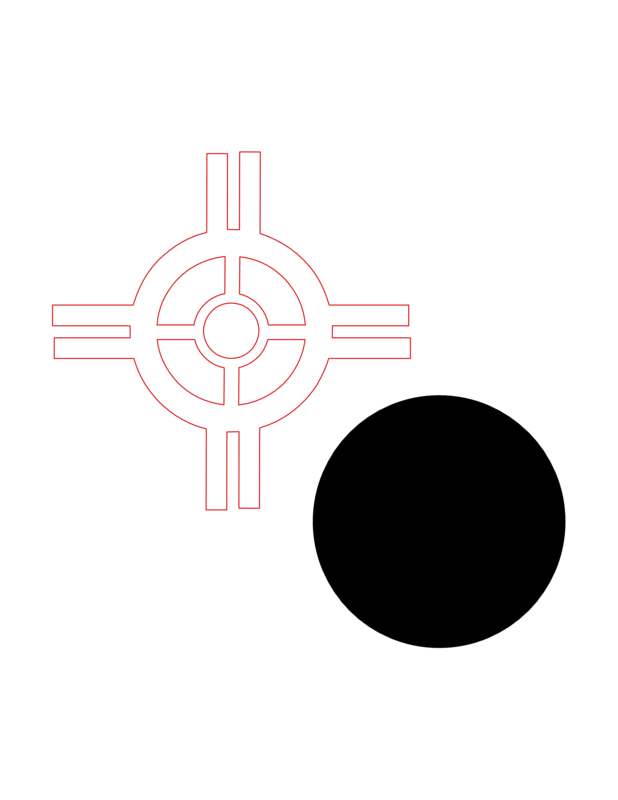 You can open in Silhouette and use the trace feature to turn this into a cut file. A quick note: using the trace feature I got the best results unchecking both the low and high pass filters, then moving the bottom threshold bar to the right. You will have to release the compound path, then delete one set of lines. I chose to delete the interior lines of each shape. To decorate, we picked up plain carboard cake plates at a party store. These were really super cheap -- the largest size was $ .65! All we needed were a couple of paint markers and we were set. We traced circles onto the plates and then painted with yellow, orange and blue markers. We used Montana markers which were easy to use, however, you needed to apply at least two coats for each color. Once they were dry I used a black marker to outline each color. We taped these targets up around the house, posted them outside and placed them on tables. Outside, we used a camouflage blanket underneath a yellow plastic tablecloth on our snack table. Thomas had seen an idea for pixy stix, so we included those in plastic camo glasses lableled "gunpowder." And you must have games. We set up two areas in the front yard: an obstacle course and a stacking target (thanks again to Pinterest for inspiration). Thomas had liked the idea of the obstacle course and designed it himself, some you crawled under, stepped through and ran around. He wanted to use tires for everyone to step through, but I vetoed that as too expensive. As a replacement we picked up small hula hoops at the dollar store. Finally, the birthday cake. Thomas wanted the same design we used on the goody bags. I have extremely limited icing skills and after having to bake and decorate cakes for both kids' parties last year, this year I wanted to let someone else take it on. We ordered a cake from the Swiss Bakery this year, after having both Giant and Safeway frustratingly screw up orders for us in the past year (um, as in going to pick up an all-white cake that instead had colored flowers and "happy anniversary" on it...). They did not disappoint! All we had to add was the nerf darts and candles. Thomas was extremely pleased with how his party turned out. He got to make most of the decisions, design and set up the games and help decorate. He even laughed at the trick relighting candles. We were delighted that he and his friends had a great afternoon.